The global economic and social actors are restructuring both private production and public production patterns. This change process is called globalization. The globalization process brings new opportunities with it. One of these opportunities is to increase the efficiency of the local government economics in public finance. The processes of globalization and localization are twin processes and are progressing simultaneously. With globalization, international capital wants to minimize the nation state and to communicate with local governments themselves. In this context, becoming a member of a local government gets ahead of being a nation-state citizen. In the globalization process, existing public goods productions are trying to simulate the market. Such efforts require the public economy to adapt to the market and such adaptation is characteristic of the local government economics itself. International capital, on the other hand, sees central government as a force to be overcome and wants to establish first-hand commercial relations with the local units. The Globalization and Decentralization are complementary concepts. In this context, the Globalization can be defined as the integration of national markets. 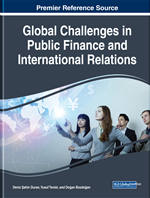 Especially, the capital flows are the main determinant in the definition of the globalization process. On the other hand, the concept of space is redefined by the new conditions that arise. In the process of globalization, where the concept of border and the limitations have lost importance, the local government structures have easy mobility instead of cumbersome nation-state structures is a more effective and useful unit in terms of the capital flows. The capital must provide its fluidity within the national borders. This brings the process called as the Decentralization to the agenda. There is a new mechanism that the entire system defines with the units (Harvey, 1999). The units foresee a new social structure advocating the local identity. Along with the globalization, the main economic actor is the local units. New production and capital patterns are based on the character of flexible production organization (Hirst and Zeitlin, 1991) and the flexible production organization characterization brings together decentralization. The flexible manufacturing is organized to be able to respond to fluctuations in demand around the world and variable needs for products (Lipietz, 1986). The aim is to sustain profitability. In addition, international production should be able to keep the production process open to change and to adapt local labor to this process. International capital, on the other hand, is seeking more income by increasing its fluidity. Decentralization refers to the formation of units that effectively utilize their own capacities and facilities and which can be incorporated into the international trade system and the world trade system (Eraydın, 2001, pp. 369). While the globalization has accelerated with the aim of overcoming the borders of the nation state and increasing trade and capital flows, the flexibility in production and new division of labor has led to the emergence of local features and localized new production structures. For this reason, the globalization and decentralization are not two opposing tendencies, but complementary processes. Privatization: The transfer of all or part of the property of public assets to private enterprises. Globalization: The integration of national markets to the world. Competition in the Public Economy: It refers to a race mechanism between the local public goods producer units in the public goods and service market. Competition Between Cities: The cities compete with other cities by using their skills they possess and develop with their economic and social accumulation. Reduction of the Public Sector: The assignment or sale of public services by private companies. Decentralization: The autonomization of local units and the identification of local identities gain importance as a driving element of the globalization process. Tiebout Hypothesis: Under certain assumptions, the person who is identified as consumer-voter would be carried by the administrative units that best fit his preferences for public goods and taxation.